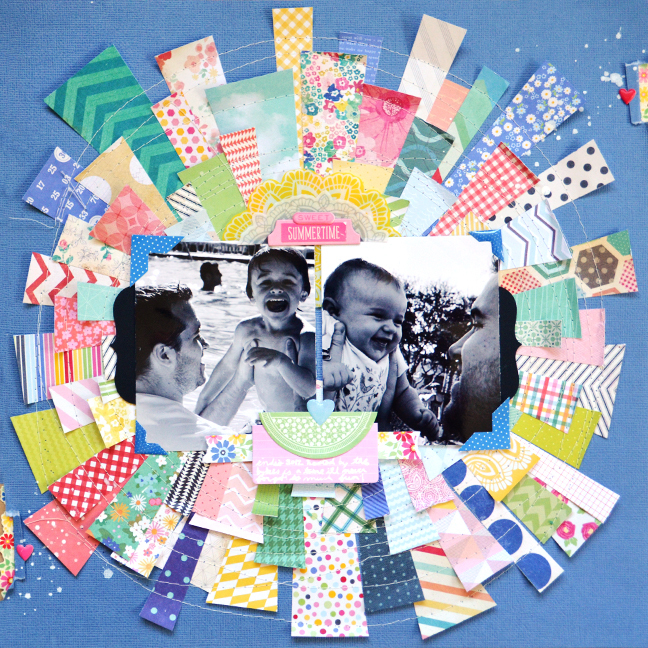 I had a pair of summer-themed layouts up on the American Crafts blog yesterday! Journaling says: This year the Annual Evans Family Reunion was at Tom & Margi's old vacation home in Black Butte, OR. So much fun! How to: Trim 2" squares from patterned paper, patterned vellum, corrugated cardstock, and spiral notebook pages then trim each square in half to make triangles. Place the triangles in circles to make pinwheels. 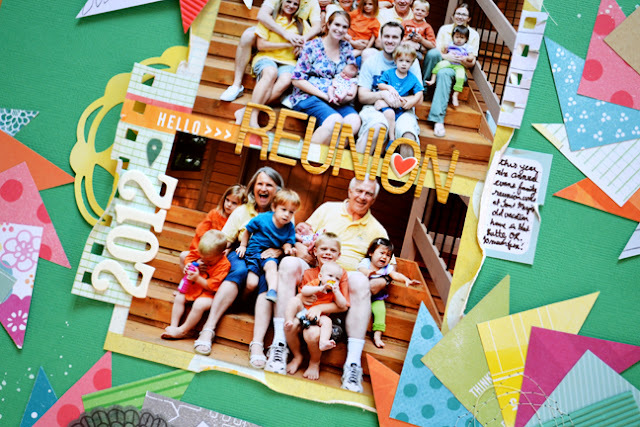 Add photos onto a yellow polka dot paper mat, crinkle the edges, then place it on the center of a green cardstock layout base. Tuck spiral notebook page pieces under the edges and add a Thickers title on top. Journal on a die cut and tuck it under the right side of the photos and tuck a doily die cut under the left edge. Place the pinwheels around the layout, add half of a doily sticker to the top and bottom pinwheels and top the doilies with a puffy asterisk sticker, then sew circles around each pinwheel to attach them permanently. Drop white spray mist across the top right and bottom left corners to finish. Journaling says: Indio 2012 hosted by the Bybees is a time I'll never forget! So much fun! How to: Trim 6x6" papers into sun-rays then place them in a sun shape around a blue cardstock background. Sew circles around the sun to attach the pieces permanently then bend up the edges. 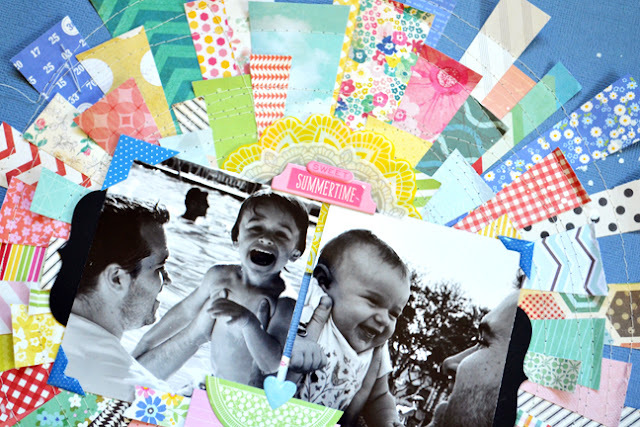 Place a pair of black & white photos in the middle and add a photo corner sticker to each outer corner. Add layered doily die cuts, a chipboard label, and "sweet summertime" stickers to the top of the photos. Place a floral paper border, journaling spot with journaling, and doily sticker trimmed in half topped with a puffy heart sticker to the bottom. Tear a section of the top right and bottom left corners, tack down the cardstock with a puffy heart sticker, then back the edges with a floral border sticker. Drop white spray mist (for pool splashes!) over the torn bits. These are gorgeous!! I loveeeeeee how many patterns you incorporate into your pages!! I can always pick out your layouts, you are amazing! Love these, Paige! 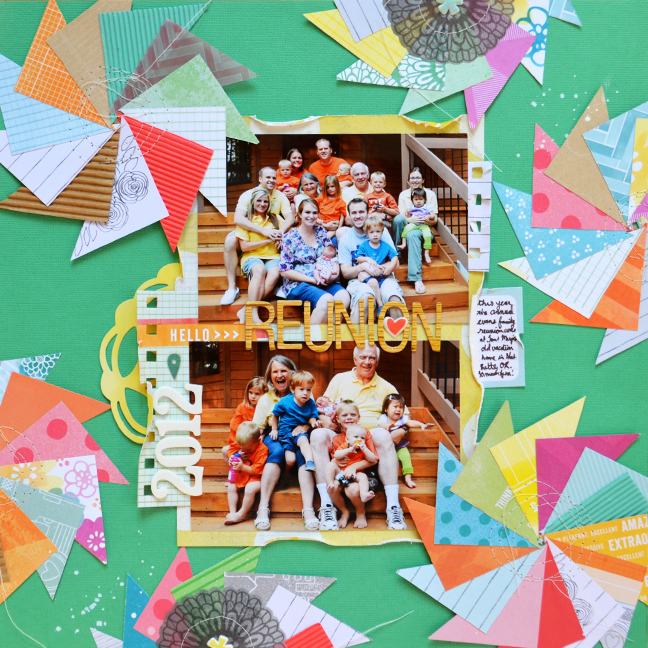 So bright, happy and fun - lots of great patterns! You are a scrappin rock star girly!!! I loveeee both of these pages and you have given me so many ideas for what to do with scraps! You rock.....big time! wow! you never cease to amaze me!! love these! WOW, how I love the way you use patterned papers and shapes and layers--simply amazing!